Hello Everyone...I am just sharing some thank you cards using some of the new products from the Waffle Flower October release. 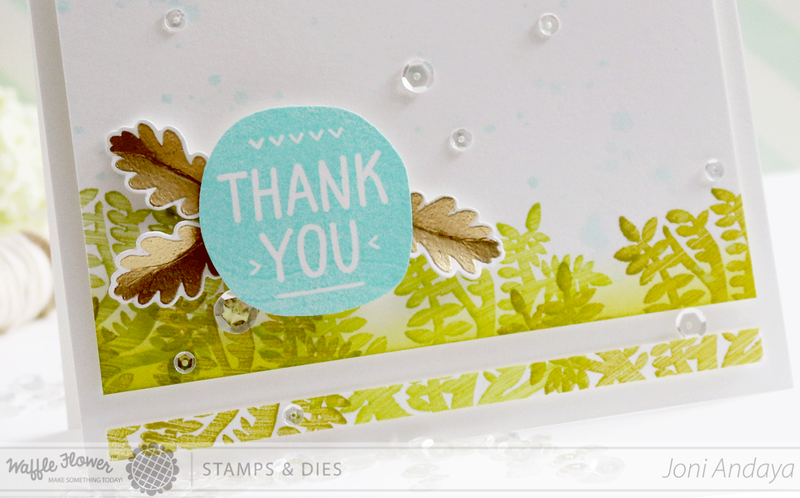 I really love this new Flower Circles die set and the Holiday Label - Give Thanks Stamp set. Really easy to combined these two products, I cut the patterned paper first from October Afternoon to create a panel for my card. I then adhere another strip of patterned paper from Crate Paper at the bottom of the panel. Next, I die cut some white cardstock using the Flower Circles die set, I stacked them together (I die-cut it five times) to make a sturdy look and feel. For the middle of the Flower Circles die, I stamped the images from the Holiday Label - Give Thanks Stamp set, then adhere at the middle of the panel. To finish off the card I added some Pretty Pink Posh Marshmallow is 6mm and the card is done. For this second card I also used the products from WFC October release 100% Love Stamp set, Tribal Thank Stamp set, Holiday Label - Give Thanks Stamp set and, Give Thanks die set. Lastly I also added some Pretty Pink Posh Sparkling Clear Sequins. Have a Wonderful almost kinda weekend. Love them both Joni! The first is just so sweet and I love the elegant gold leaves on the second! These are so beautiful!! LOVING those little leaves on the second one!!!!!!! These are so beautiful Joni ! Both of your cards are absolutely lovely! Love the colors! These are both gorgeous Joni! Just beautiful, Joni! Love these! Love both cards! Well done, Joni!